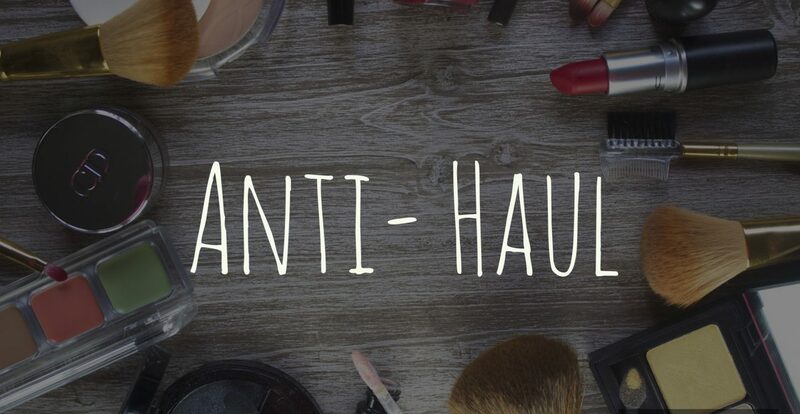 Recently the Anti Haul has become a bit of a thing (Thank Kimberly Clark), and honestly I think it’s a great idea. As Kimberly would say you need to adopt a policy with yourself of ‘don’t need it, not gonna buy it”. The point being made here and one that I think is very valid is that people feel obliged to buy things because they are frightened of missing out on the latest beauty hype. In an age of YouTube and mass advertising the newest products are seen everywhere, however its important not to forget that these people are often getting paid to talk about or are sent these products for free- often meaning they will talk highly of them. Now don’t get me wrong some of these products might be amazing but its important to be sensible when thinking about splashing out loads of cash on a product just because everyone else has it. Now I buy and have bought a lot of beauty items in the past due to my job at Boots- beauty is unavoidable, I see it everyday, but this year I’ve been stricter with myself. So far I have done well at sticking to the idea of using up what I already own before I go splashing the cash on all things shiny and new (Empties post coming soon). The last new makeup I gained was actually at Christmas when I became overrun by eye shadow palettes.
. Too Faced Sweet Peach Collection– EVERYONE is either hauling or anti-hauling this stuff at the minute. I like Too Faced but for me this collection simply just doesn’t jump out at me colour wise, it’s not to my personal colour palette. Oh and it all smells like Peaches which is a deal breaker for me I’m afraid.
. Kylie Cosmetics– This is a controversial one, as everyone seems to love their lip kits. For me I’ve never been a huge fan of the Kardashians anyway and I’ve actually heard reviews of the lip kits saying they are nearly impossible to remove at the end of the day and that the quality of the eye shadows is questionable. I think for this one I’ll just stick to my NYX Lip Lingerie’s.
. Anastasia Modern Renaissance Palette– Now this one I’m tempted by, warm toned pinks reds and browns? Yes Please. However as I already mentioned I received a ton of new makeup at Christmas so I already have these shades in my collection such as the trusty Zoeva Cocoa Blends and my Morphe Fall into Frost Palette.
. Cushion Foundations- Now this might just be me being a little bit fussy but I just feel like these are unhygienic. I don’t really have another valid excuse for not buying other than this and also maybe that I have never preferred a pan foundation to a liquid formula.
. L’Oreal Multi-masking– This is a collection of 3 facemasks that can be used to detox, add glow and purify the skin. Everyone has raved about these but I’m not keen- one because I’ve decided I don’t really want to purchase from a brand that tests on animals (see my How Cruel is my Makeup Bag post), but also because I am a loyal user of the Lush Mask of Magnaminty, which has done me just fine. Hopefully this post hasn’t been too negative, like I said I’ve just decided to be a bit more considerate about what I’m buying instead of panic purchasing before the latest limited edition thing sells out. I love this idea! It seems like such a fun way to approach cleaning out clutter! Yeah I just think if you don’t buy it in the first place it can’t get in the way!